American women deserve an amendment that will provide constitutional protection against gender discrimination. The Equal Rights Amendment would not only guarantee protection for women, but for all American citizens. In 2012 a big crowd turned out to send the message: Women DEMAND EQUALITY! In the two years that followed many states adopted legislation that imposed regulations and restrictions on voters disenfranchising women and minorities and limiting our right to vote. Additionally, the Supreme Court has nearly gutted the Voting Rights Act and made it abundantly clear with the Hobby Lobby Ruling that a constitutionally protected religious right trumps a women's right to sovereignty over her own body and privacy. We Are Woman, in partnership with ERA Action and PDA, are mobilizing and going even BIGGER in 2014! 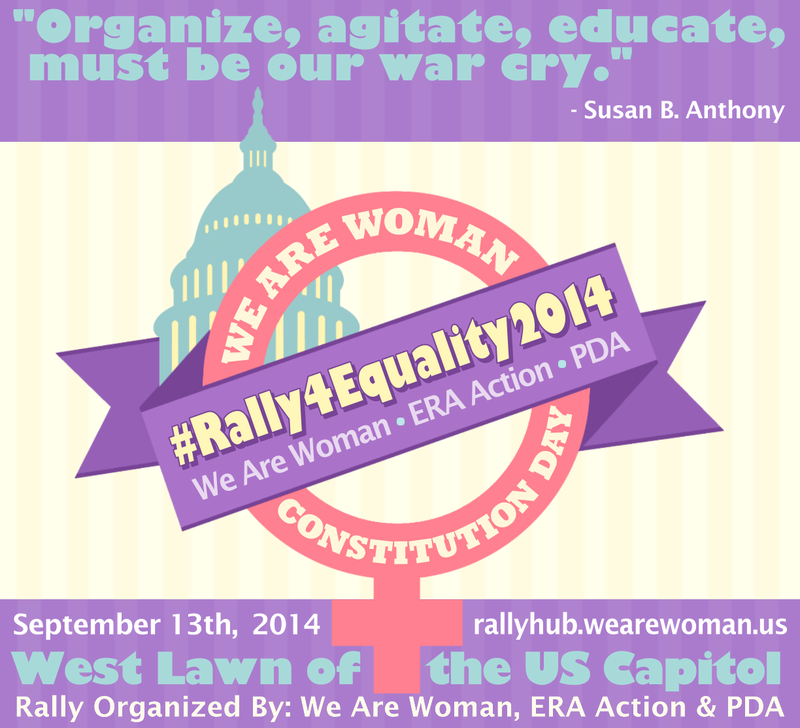 Join us September 12, 2014 for a Day of Action and Saturday September 13, 2014 for the We Are Woman Constitution Day Rally, on the US Capitol West Front Lawn. We are rallying for women’s rights, voter rights and the ratification of the Equal Rights Amendment. For rally details and to see a list of this years speakers and entertainment please visit our Rally Hub. Pledge to Vote When women vote, we win! Attend & encourage others. Register and receive email event plans and updates. RSVP for the Day of Action: Please register to lobby legislators to remove the ERA deadline. Join Our Forum: Meet and organize with others from your area. Book Your Hotel Room: Discount - (September 11-13). Connect before, during and after the event! Find/Register for a Bus to the Rally: Find buses and register for one. Order Food: It’s a daylong rally and we don’t want you to go hungry! No vendors allowed on lawn. Volunteer: Share your talents and resources to help us make event successful. Become a Rally Sponsor to help with our ongoing efforts and make this event possible. Reserve a Table: Share your organization with attendees. Donate, Purchase items at our Rally Hub store or Shop our Cafepress Gift Shop Be sure to check out our custom designed, limited edition ERA Silver Plated Bracelet. Come stand with us in Solidarity! please sign up for our new mailing list HERE. Thank you!